Eko Atlantic, officially Nigeria International Commerce city, also known as Eko Atlantic City, or the initials E.A.C. 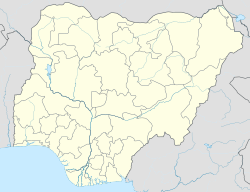 and E.A., is a planned city of Lagos State, [Nigeria], being constructed on land reclaimed from the Atlantic Ocean. Upon completion, the new peninsula, which is still under development is anticipating at least 250,000 residents and a daily flow of 150,000 commuters. The development will also have a positive environmental impact, as it will help in stopping the erosion of Lagos State's coastline. The city adjoins Victoria Island district of Lagos city, and the Phase 1 area of Lekki to the north, while the entire Western, eastern and southern borders is a coastline. Eko Atlantic is expected to rise as the next generation of property on the African continent; having a total of 10 districts, spread across a land area of approximately 10 square kilometres (3.9 sq mi), the city will satisfy needs for financial, commercial, residential and tourist accommodations. Eko Atlantic development is being carried out as a Public–private partnership, with private companies and investors providing the funding, whilst Lagos State Government is a strategic partner, with the support of the Federal Government. The Contractors are China Communications Construction Group, a company that works in the field of marine dredging and landfill operation. Consultants are Royal Haskoning (traffic and transport expertise) and ar+h Architects. South Energyx Nigeria Ltd., a subsidiary of the Chagoury group, was specifically created to undertake the development. Testing of the sea defence system took place at the DHI Institute in Copenhagen, Denmark, where models were successfully tested for one-in-a-hundred-year ocean surges, and one-in-120-year, one-in-150-year and one-in-1,000-year storms. Eko Atlantic will satisfy needs for financial, commercial, residential and tourist accommodations, with infrastructure in line with modern and environmental standards. These standards will offer the city’s residents water, waste management, security and transportation systems. The city will also have an independent source of energy generated specifically for the city. The Eko Atlantic City project received global attention in 2009, as the Lagos State Government and its private sector partners on the Project, South Energyx, received the Clinton Global Initiative Commitment Certificate. As of May 2009, while the project was still in its dredging phase, about 3,000,000 cubic metres (3,900,000 cu yd) have been sand-filled and placed in the reclamation area, while about 35,000 tonnes of rock have been delivered to the site. In certain parts of Bar Beach, the land being reclaimed can already be seen. Dredgers are working around the clock to fill the site with sand. On 21 February 2013, a dedication ceremony was held at the reclaimed land of Eko Atlantic, with Goodluck Jonathan, Bill Clinton, Babatunde Fashola, Bola Tinubu, Aminu Tambuwal, and Ibikunle Amosun attending. In March 2014, David Frame, managing director of South Energyx Nigeria Ltd., the firm responsible for the development, confirmed that "The first residential tower will open in 2016". The Eko Atlantic project has been criticised by local residents living nearby, saying that ongoing construction works have caused coastal erosion and ocean surges; as ocean water surges through living areas, flooding access roads and taking down electricity poles and forcing residents to relocate. The Lagos State Government is also being criticised for failing to involve the people in the project. In August 2012, the Atlantic Ocean surged and overflowed its banks, sweeping 16 people into the Atlantic Ocean, killing several people and flooding Kuramo Beach, Victoria Island and other areas. According to an environmental expert, "the ocean surge occurred as a result of the failure of the contractors handling the sandfilling activities of the proposed Atlantic Ocean City, to put in place measure that would reduce the effect of the surge on the environment". The Lagos State chapter of the People's Democratic Party issued an official statement, blaming the ACN now APC led state government's sand filling for the ocean surge. The party called for a stop to the Eko Atlantic project and immediate compensation to the bereaved families. ^ a b "Registered Free Zones in NIgeria". NEPZA. Retrieved 13 August 2016. ^ Lizzie Williams. Bradt Travel Guides (3rd ed.). Paperback. p. 87. ISBN 978-1-8416-2397-9. Retrieved July 26, 2014. ^ a b Dada, Akinpelu (2011-03-17). "'Eko Atlantic City Project has expanded Nigeria's territory – Fashola'". The Punch. Retrieved 2011-07-28. ^ "Eko Atlantic - About Us". Eko Atlantic. Retrieved 20 February 2016. ^ Gboyega Akinsanmi (22 February 2013). "Clinton: Eko Atlantic City, Destination for Global Investment". Thisday. Leaders & Company. Archived from the original on 24 February 2013. Retrieved 22 February 2013. ^ Oluwole Farotimi & Maduka Nweke (22 February 2013). "Jonathan, Clinton, Fashola tip Lagos as world tourists' destination". The Sun (Nigeria). The Sun Publishing Ltd. Archived from the original on 24 February 2013. Retrieved 22 February 2013. ^ "Nigeria's Eko Atlantic open to first residents in 2016". This Is Africa. 10 March 2014. Archived from the original on 2014-04-09. Retrieved 11 April 2014. ^ Okenwa, Stan (6 February 2012). "Fear Grips Eko City as Lekki Residents Experience Sea Rise". AllAfrica.com. Retrieved 29 March 2012. ^ Njoku, Jude (25 January 2012). "Raging Controversy Over City in Atlantic Ocean". AllAfrica.com. Retrieved 11 February 2012. ^ Iroegbu-Chikezie, Okwy (31 January 2012). "Experts' endorsement for Eko Atlantic city". The Nation. Lagos, Nigeria. Archived from the original on 14 February 2012. Retrieved 11 February 2012. ^ Akinpelu, Dada (28 December 2009). "Eko Atlantic City: Daring the waves". The Punch. Lagos, Nigeria. Archived from the original on 7 July 2012. Retrieved 11 February 2012. ^ Ezeobi, Chiemelie (19 August 2012). "Lagos Ocean Surge Levels Kuramo Beach". AllAfrica.com. ThisDay. Retrieved 11 October 2012. ^ a b "PDP blames sand filling for ocean surge". The Punch. Lagos, Nigeria. 22 August 2012. Archived from the original on 23 October 2012. Retrieved 11 October 2012. Brown, Brad (5 June 2012). "Nigeria's most populous state poised to become a metropolis". South Florida Times. Florida United States. Retrieved 23 June 2012. Iroegbu-Chikezie, Okwy. "A city behind walls". The Nation. Lagos, Nigeria. Archived from the original on 22 February 2013. Retrieved 23 June 2012. Akinsanmi, Gboyega (28 May 2012). "'Eko Atlantic City'll Generate 150,000 Jobs'". Thisday. Lagos, Nigeria. Archived from the original on 31 May 2012. Retrieved 23 June 2012. Tautou, Annabel (21 April 2012). "Africa Working On World's Biggest Project". French Tribune. Bouches-du-Rhône, France. Retrieved 23 June 2012. Onyema, I. C. (18 September 2012). "That Kuramo Beach ocean surge". Business Day. Lagos, Nigeria. Archived from the original on 4 December 2013. Retrieved 11 October 2012.